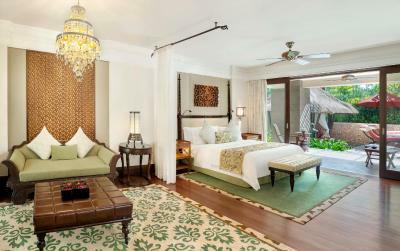 Lock in a great price for The St. Regis Bali Resort – rated 9.5 by recent guests! The hotel was the best option, and it exceed the expectations.!!! I can say... The best experience ever..!!!! The service and the people there was the best.! 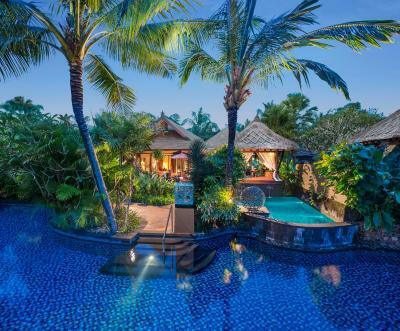 The entire property is lavish...from the villas to the spa, to the restaurants. Staff members are extremely respectful and understanding of various cultures. The breakfast is out of this world. The spread includes food from all over the world. A great chance to enjoy different cuisines over a meal that not always appreciated. Beautiful resort, fantastic staff, excellent restaurants, breakfast buffet one of the best I have experienced. 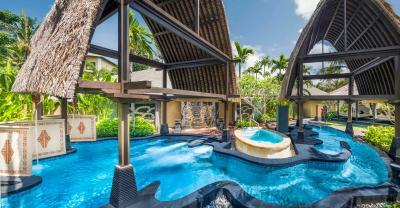 Lagoon Pool Villa exceeded expectations! 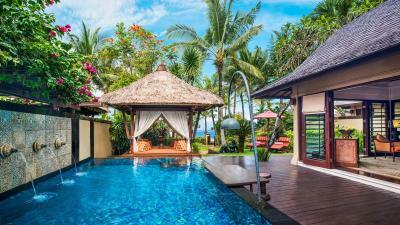 The Facilities, Kayuputi the best restaurant on Bali, perfect Breakfast and the beautiful Beach Villa. The Service is exellent. The butler service was excellent as we were traveling with children aged 4 years and 10 months.The food was very good both for breakfast and the restaurant.The whole experience was very good and will definitely go back again. Everything this property and staff were absolutely incredible. Best resort I’ve ever experienced! We loved the service, amazing breakfast and dinner buffet and the lagoon pools. 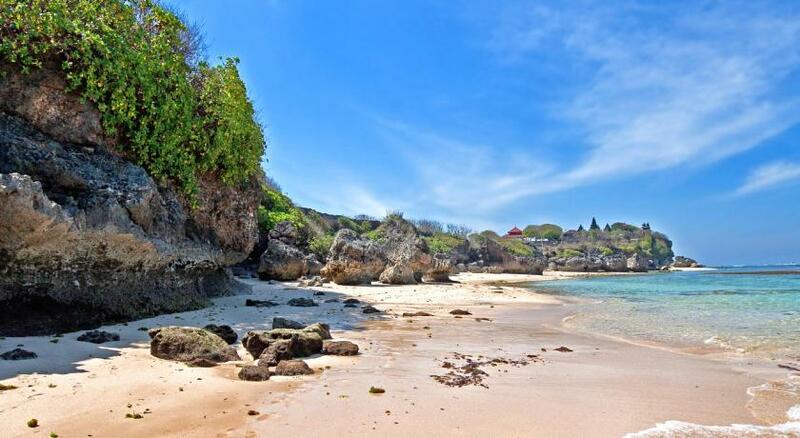 The beach was great too for our family, in all a great choice for a luxury relaxed stay. 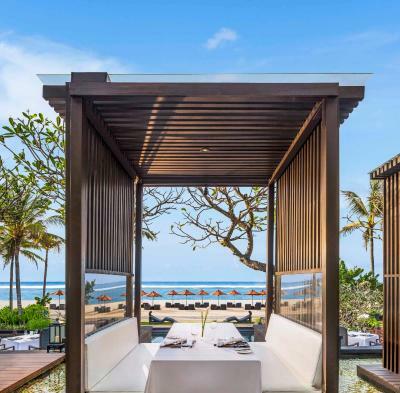 The St. Regis Bali Resort This rating is a reflection of how the property compares to the industry standard when it comes to price, facilities and services available. It's based on a self-evaluation by the property. Use this rating to help choose your stay! 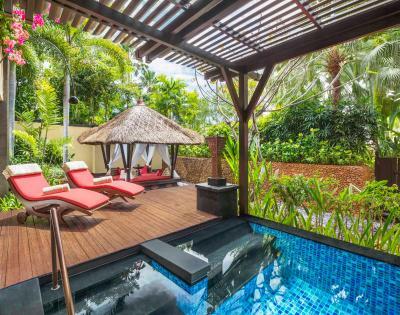 One of our top picks in Nusa Dua – and a guest favorite. 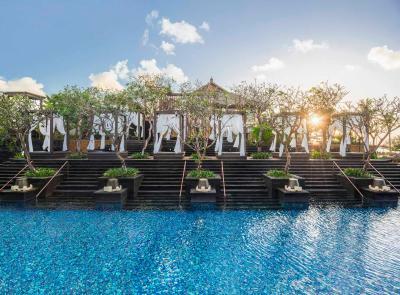 Directly on the beachfront of Nusa Dua, The St. Regis Bali Resort is a property featuring a full spa and an outdoor lagoon pool. A free two-way airport shuttle with a limousine is provided. 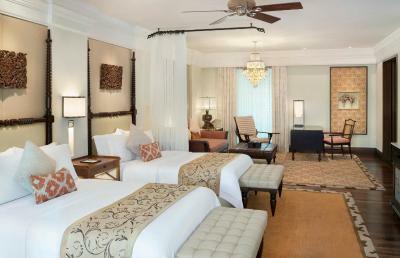 Free WiFi is provided throughout the resort and in the rooms. Decorated with cultural fabrics and enjoying sea views, all villas and suites are fitted with an iPod dock, flat-screen TV and DVD player. 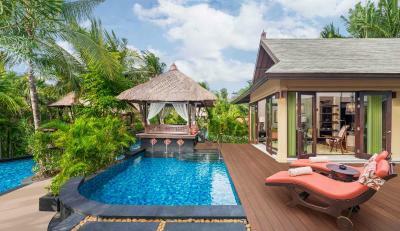 Each comes with a balcony or terrace overlooking the garden, pool or ocean. 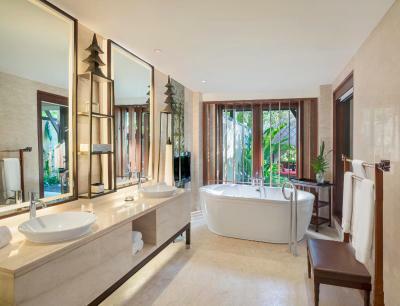 Select suites and villas feature a private hot tub or plunge pool. Personalized St. Regis butler services are available 24 hours. Guests can work out in the fitness center or head for a relaxing sauna session to unwind. A concierge desk and 24-hour front desk is available. European cuisine is featured in Boneka Restaurant while Kayuputi Restaurant specializes in seafoods. Gourmand Deli offers pastries while drinks are served in Vista Bar and King Cole Bar. 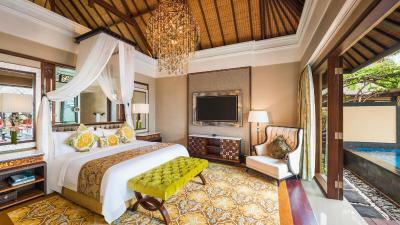 When would you like to stay at The St. Regis Bali Resort? This double room features a balcony, tea/coffee maker and tumble dryer. This double room has a soundproofing, electric kettle and DVD player. This double room features a patio, DVD player and mini-bar. This double room has a DVD player, kitchenware and patio. This double room features a mini-bar, stovetop and DVD player. This double room has a dishwasher, private pool and dining area. This double room features a dining area, private pool and microwave. 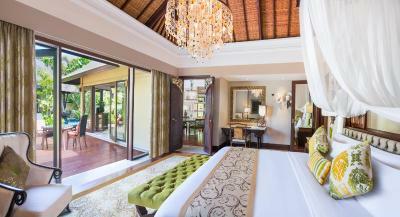 The exceptional 81 suites, 41 villas and 1 residence provide legendary bespoke Butler Service, award-winning dining venues, bars, a distinctive Remède Spa, Fitness Center and an intelligent Children’s Learning Center. 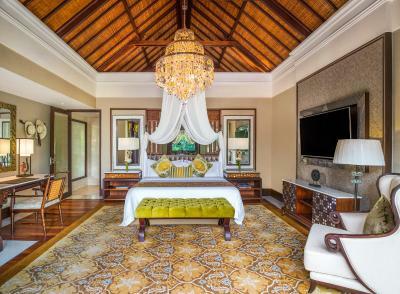 House Rules The St. Regis Bali Resort takes special requests – add in the next step! 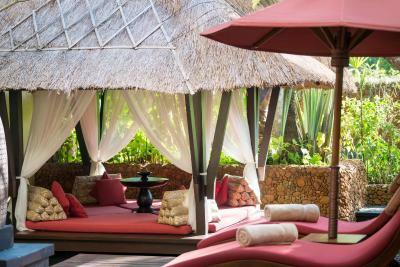 The St. Regis Bali Resort accepts these cards and reserves the right to temporarily hold an amount prior to arrival. Please note that the hotel will verify the credit card used for the reservation. 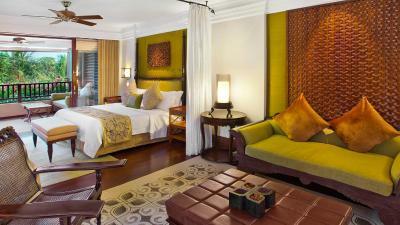 The same credit card must be presented upon check-in and must be valid during the entire stay. If booking is made on behalf of someone else, guest must contact the hotel directly to arrange for third-party billing. 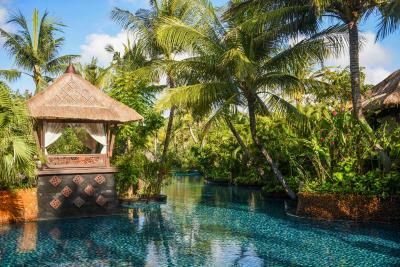 Please note that on Silent Day (Hari Nyepi) 7 March 2019, there is no check-in or check-out at the hotel. Guests are confined to the resort grounds, and they are requested to keep noise to a minimum out of respect for this religious celebration. Ngurah Rai International Airport will be closed, motor vehicles are allowed on the streets only for emergencies. 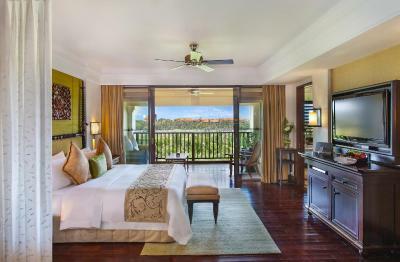 Please inform The St. Regis Bali Resort of your expected arrival time in advance. You can use the Special Requests box when booking, or contact the property directly using the contact details in your confirmation. Great for families only, nothing much to do for singles. THE SPECIAL MENU BRUNCH IS GREAT! I really have to think hard to express a negative aspect to our stay.....nothing comes to my mind immediately!